No fake 5* reviews for Camelot Castle Hotel for a whole EIGHT days! 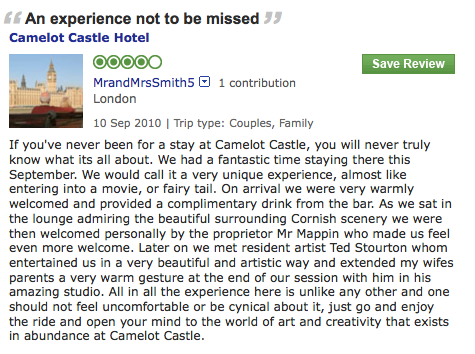 There’s a lot we can learn about what’s going on at Camelot Castle Hotel – from the reviews alone. 1) Whose is the dominant ego? Ted Stourton is the driving ego behind all the Camelot Castel Hotel nonsense. If you couldn’t tell it from the awful ‘art’ all over the hotel, the pushy hard-sell of his paintings to poor, unsuspecting guests, the non-stop Ted-worship in John’s ‘Independent News’ publications or the ridiculous gallery in Tintagel, you can tell it from Tripadvisor’s own keyword list. Ted and his loopy Light Box are, as you can see, top of the list. If this hotel was on the edge of Niagra Falls, you’d expect the words ‘Niagra Falls’ in a high proportion of reviews. But ‘Light Box’?? LOLS. 2) Who do they think they’re fooling? The people at CCH seem to think that so long as they have more (fake) good reviews than bad, they’re in the clear. WRONG. Normal hotels have a LOT of one kind (good or bad) and far less of the others. They DON’T have 200 ‘excellent’ ones and 140 ‘terrible’ ones. If they do, it’s 100% certain that something is very, very wrong. Either the good ones are faked or the bad ones are. All that’s left is for the general public to decide which. And they’re a hell of a lot better at doing it than you think. Yes, Ted and John. Have you noticed that the public are telling you what they think of your self-penned reiews? They’re voting the 1* reviews ‘helpful’. They’re NOT voting the 5* ones helpful. That’s because the public don’t believe your hype. And they’re THANKING people who have had the balls to tell the truth to the rest of the world because they’re grateful that those reviews have saved them from wasting their money. Yes. “Why not splash out on the deluxe suite complete with ornate four poster bed and amazing en-suite. All in a location that will take your breath away” said one recent obviously fake 5* review. When a review sounds more like one of those cheap local ads that you used to see in the cinema in between the Gordon’s gin ads…then you know it’s fake. I have been reading your web postings with interest, since googling Camelot Castle Hotel folowing concerns of many of us who actually live locally about the goings on here in the village. We have had yet more DVD’s arriving through our doors and more pressure to join this oddball scientologist religion. The Mappins and Ted have been urging local people not to read the web and to check out their recommended ‘reading list’ for accurate information on them and their church. They have listed their own website as ‘trustworthy’ and have pointed out that all future information on local news and events can be accessed either, directly from the Hotel, or through their Tintagel Independent news blogger. This village really is under seige from these people. So please keep up the good work with your sane website. Thanks for that, it makes a change from the usual Scientology threats 🙂 Keep spreading the word in your own way about these people. This stuff isn’t ‘quirky’ or ‘eccentric’ its contemptuous and offensive and needs to be run out of town. Scientology kills. Your website is playing this as farce. We don’t want Hubbard or his cult here. Worthy as your site is, please make clear the seriousness of this cult’s harmful reach. I am with Jess on this. WE DO NOT WANT SCIENTOLOGY IN TINTAGEL. HELP US TO GET RID OF THEM. AND STOP PLAYING THIS FOR LAUGHS. IT DOES NOT HELP. This cult is seriously dangerous to unsuspecting and vulnerable people, agreed – which is why we do what we can to raise awareness of what these people are doing. Beneath the farce, we’re also serious and we’ve taken action. We ARE helping you to get rid of them. What are YOU doing about it? You have no idea how much we’ve screwed up their expansion plans just by laughing at them on the Internet. Agreed. Scientology ruins lives, and it kills people. Just take a look at http://www.whyaretheydead.info for several dozen reasons to oppose this stupid UFO cult. L Ron Hubbard made his millions, lived his life fat, drunk, bigamous and happy… and now he’s gone: why does his cult have to continue breaking up families and destroying people? Let’s get this cancer out of Tintagel forever.